Ever since 1913 the Royal Horticultural Society have brought the very finest in garden design and general horticulture, presenting new and established plants and planting methods on a backdrop of exciting and ever-changing design. Our Chelsea Flower Show packages are a more recent innovation! We have now sold out of our 2017 Packages. 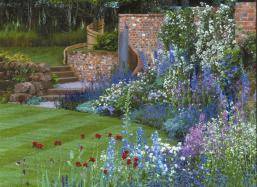 We do have availability for the 2017 Hampton Court Flower Show. Otherwiseplease bookmark this page and we will update it as soon as we have 2018 packages available. Visitors can pick up a wide range of gardening accessories, and many new gardening products make their debut at the show. Those wishing to learn and discover some of the latest scientific developments in horticulture must see the Lifelong Learning exhibits within the Great Pavilion. The latest trends in floral art and floristry can also be seen at the show. Although it is not the biggest show in London (Hampton Court holds that record and packages for 2017 Hampton Court Flower Show are available too) Chelsea Flower Show Packages are arguably the most famous and hundreds of thousands of visitors pass through its gates every year. Our own record is a little more modest but for the last eight years we have been offering Chelsea Flower Show Packages including event tickets and overnight hotel accommodation helping over 12,000 keen gardeners get to the event. Our ticket and hotel packages include a day ticket to the flower show and we now only have availability for the Friday 26th or Saturday 27th May 2017, 1 or more nights’ hotel accommodationin a three, four or five star hotel starting on the night before your entry. Prices start at just £146 per person and include service and VAT at 20% and is based on two people sharing a twin or double room – so find a friend to go with. Breakfast is included with most packages but can be an optional extra at some hotels. A few years back the Evening Standard ran a short survival guide for the would-be Chelsea Flower Show visitor. Here are what we think are the most important tips, representing some excellent advice on how to make sure the show doesn’t take it’s toll too much! Footwear: There is, quite simply, nothing more important than wearing the right shoes. Make sure they are comfortable and hard wearing, basically leave the stilettoesat home – you might find yourself stuck in the mud during one of Chelsea’s infamous downpours and Diarmuid Gavin is not going come and pull you out: believe me! Plan ahead: you can buy your catalogue, it is a lovely way to get all the information. It’s like having a list of all your Christmas presents before you open them, a great way to get in the mood! And there is a handy map inside to plan your day. Water: Carry a couple of bottles to avoid shelling out for some overpriced bottled stuff of dubious provenance. Plant Societies’ Stands: Don’t forget to visit them – you can get specialist advice and find some interesting rarities. Credit card: Take one if you cannot resist being the first to buy new varieties. On second thoughts, leave it behind. Tact: Try to avoid saying out loud things like, “My six-year-old could have done better.” The person next to you is probably the designer. This is good advice for art galleries too! Bun fight: If you are feeling strong, try the plant sale at the end of the show. It is signalled by a bell at 4pm and makes the Harrods sale look like a walk in the park. But check what you are buying is in good condition. Cars: Don’t take the car – parking is very limited. If you do drive to London choose a hotel with parking – the closest are The Holiday Inn London-Kensington Forum and the The Comfort Inn Hotel Vauxhall. As I mention above, the packages we offer include one day entrance tickets and overnight accommodation at a nearby hotel.